My granddads were as different as night and day. One Irish, the other Dutch. Both had worked as coal miners and farmers. My mother’s Dutch father had also owned a herd of thirty dairy cows. My dad’s Irish father was known to make a little moonshine from time to time. So what could these fellows have in common? The part of Alabama that I hail from has many caves and natural underground water sources. Several artesian wells near my birthplace have flowed non-stop since before I was born. The city park in my home town was built near one such well so that its run-off could fill the public swimming pool. The water from this well is so cold you can hardly drink it, let alone swim in it. The amount of natural water pressure produced by these wells is quite amazing. The one in the city park has maintained a constant flow and 98 pounds of pressure for the last one hundred years. Mother Nature must have one hell of a pump. In spite of the artesian wells and even more prolific are the hundreds of natural springs. Springs are almost magical. I’ve never seen one that wasn’t in a beautiful lush setting, no doubt the benefit of the clean cool water. Natural springs, like their artesian cousins, will produce water forever if kept up properly. The springs were so plentiful that many early area homes in the 1800s and 1900s used them for their sole source of water. If a spring wasn’t too far from the house you simply carried water from spring to house in buckets, a job that most times fell upon the younger members of the family. Of course the spring itself needed to have a storage facility of some sort to catch and store the spring water. A simple barrel to catch the water worked fine, but springs and spring houses became an art form of sorts and therein lay the beauty and magic of these little bubbling water sources. Both my granddads were spring lovers and self-taught experts, a condition that has infected every male descendant to some extent. The most useful and nicest spring house I ever saw was in LaMar County. It had served as a water source for the entire community, but as time went by most everyone managed to get a well for their homes. The spring was less used as a result. Still, on nice summer days and even some winter days all the women in the neighborhood would come and use the spring to do their wash. The spring water was rumored to wash clothes cleaner than the well water. The builder of this spring house had made provisions for laundry, milk cooling, and good drinking water. There were three cast-iron wash pots and a clothesline just outside the spring house. Those who used the facility would bring fire wood to heat the pots to get hot water. Two pots for boiling clean water, one for boiling clothes. It wasn’t unusual to see eight or ten neighborhood ladies doing their wash. Most everyone kept their milk in the extra spring tank used just for that. Remember, this was before electricity reached this rural area. As I said, this spring house was unlike any I had seen. Two concrete holding tanks (open-top rectangular boxes) six feet long by three feet wide by three feet deep. The spring flowed out of a small bluff into a five gallon metal pail that was wedged into a hollowed-out nook in the bluff. The water filled the pail until it ran out of an overflow hole high up on the side of the pail. This overflow ran off into the first tank until it was full to the overflow level, and then it filled tank number two. The tanks were placed end to end with a roof over them that protected against rain and bad weather. The sides of the spring house were made up as a lattice work, which favored warm weather. There was also a homemade concrete shallow sink that added to the flexibility of the entire set-up. The spring house had a poured concrete floor with the overflow of the second tank piped outside and feeding the small stream that the spring had fed originally. My mom’s dad was so impressed that he built a duplicate spring house for his sister-in-law. It was a community showplace. My Irish grandpa took a slightly different approach. He and most of his customers had a taste for moonshine made with sweet spring water. On the other hand, the state ABC (alcoholic beverage control) and the Feds frowned on the home brewing of “hooch” no matter if it was spring water or stump water. Grandpa scouted around until he found the perfect site to set up his still. Not a lattice work spring house but a large cave with cross ventilation and a good healthy spring to make his sour mash. The cave’s natural ventilation pulled the smell and smoke of the mash cooking fires away from the still and let it out under the hollow bank of a small creek about one hundred and fifty yards away. Grandpa would go in just at sunrise and boil the corn mash. The morning fog from the creek completely hid all the smoke and the smell. Wood smoke smell at breakfast time was perfectly normal in an area where lots of people still used wood burning cook stoves. As long as Henry used that still, the law never found it. Finally, as he approached ninety years of age he revealed the whereabouts of it to a retired ABC officer who had become his friend during the years they had played cat and mouse. Turns out to have been not far from a well-traveled road that ran parallel to Cheatom Creek, a location about six miles from grandpa’s place. My dad had located four springs on his property prior to his death. He had a fellow with a bulldozer clear and grade about an acre which gave him a cleared spot that was also deeper. The dozer operator then used the leftover brush and dirt to build a dam. The result was a really nice pond fed by two of the springs. Dad kept the area around the pond mowed and cleaned. It was his prize among all his possessions. Springs require little if any upkeep except for one or two small items. You’re going to need to get yourself some spring lizards. They’re little bitty things. Real black in color with maybe a thousand white specks all up and down their backs. These little things look like salamanders, although Paw Henry swore that only a certain salamander will work. Their special characteristic is the ability to live in the very cold spring water. The little guys keep the waterways in the spring cleaned out. Dry weather will cause the spring to plug up. 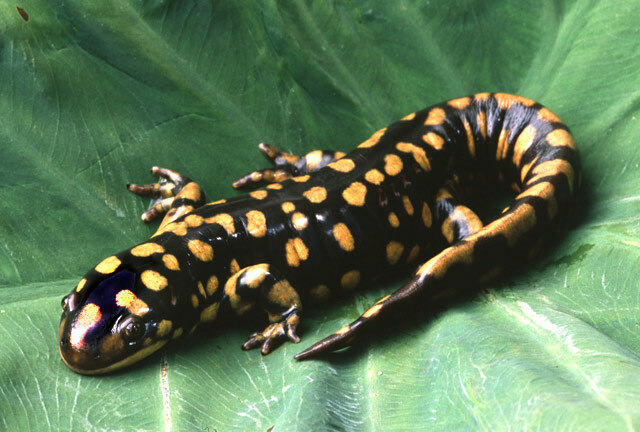 The salamander prevents that from happening. So, if you see one in a spring, don’t harm him. If your spring goes dry in summer, get a spring lizard. It works every time. Yuckie lizzards,but springs are so beautiful. How do the lizzards clean them out? The Lizards need the water to live. They will keep all the passages to the source of the water flow open. Not exactly “Rocket Science” but it works. How,exactly,Larry,do they do it? Do they eat the stuff or move it? When I was about 9 years old,we lived on 15 acres of my grandmothers land. This land had a beautiful spring and was a source of great joy to my brother and me. One particularly cold winter,a group of distant relatives came to visit us. They walked the property with us to look around. The creek had a wonderful rope swing across it,I can’t remember who had put it there. We swung across it constantly in warmer weather and jumped in the spring. This one day, I, always wanting attention, was going to impress the relatives with my great skill at swinging across the spring. Just as I,dressed in a huge coat, the temperature being about 20 degrees,swung across,the rope broke. I was frozen, but the worst part was the enormous humiliation,I have never forgotten. Wet,cold and humiliated,I ran to the house and didn’t come out of my room until they left. I still love springs,but always think of that terrible day in my life. Now,I realize,the relatives didn’t think badly of me,stupid kid stuff. The little Salamanders swim through the cracks and crevices that tend to get blocked, especially in dry weather. Their activity keeps everything open and the water flowing. I have a similar swing story that I will tell soon. You’ll get a laugh from it. You should consider expanding this into a somewhat longer essay and submit it to Readers Digest. It’s the kind of thing that I think they’d really go for. I enjoyed the story, it really hits home.Well the lizards do work. We bought an 1860’s farmhouse with a spring house that has one of the largest springs in the area, the area also being one of the most popular moonshine areas of Tennessee. I think I was born in the wrong era though. This house has never had inside plumbing, all of my water comes from the spring. Yes, that means we still have an outhouse. We moved in during the summer and It wasn’t too bad to carry water, but now that it’s cold it’s a little more of an inconvenience. I have animals,some of the neighbors calls it my Old McDonalds farm. I have 3 quarter horss, 2 miniature horse, 1 miniature donkey, these are in one field. On the other side of the house I have a large area fenced for the rest, 2 turkeys, 2 Tennessee fainting goats, 7 pheasants, 13 quail, 8 cornish hens, 13 Rhode Island Red Chickens, and a rescued wild boar that now sleeps with my goats in their house. It may sound crazy, but when you leave the city so to speak and move into another century way of life it really makes you have a greater respect for all those who have lived before us and what a day was really like for them. Most people think that we have pretty much lost our minds, especially now that it’s cold and to have to heat water to bathe is really time consuming, and to wash dishes. So for all those out there who thinks that life without all the frills is tough, your right it is, and everyone should have to spend at least one week living in the past. I will be glad when we get the fiel line put in so we can set up the pump for the spring water and more importantly, flush that little silver handle again. Aw yes, freedom from the chamber pot. The area where I live in Tenn still has many of the old homes. They were built to be around for a spell. Larry- This was a great story. It brought back memories of my childhood in East Texas. From the time I was 5 my parents packed us off to the country on Christmas break and again in the Summer. Teresa I remember having to use the outhouse on cold winter nights. All the children would go at the same time because we were all afraid of the dark and what might await us once we were inside. I live in a home here in Texas that was built in 1913, it does have indoor plumbing and central A/C and heat. It was all upgraded before I bought the home (thank goodness). The only things lacking is a nice fireplace I do miss that my other home had one and needless to say I miss that. My hat is off to you for being able to carry water up to the house in the winter. I know how cold it gets in Tenn.